For once, absolute evil is correct. Curing disease is not in Goldman Sachs’ interest. True to their nickname—The Root of All Sin—Goldman Sachs is trying to find an angle on human misery. Given their impressive track record, we ought to be worried. The sooner everyone realizes that the interests of Goldman Sachs and humanity’s diverge, the better. In truth, Goldman Sachs’ profit-hunting is unremarkable. Predation and greed are their nature; you might as well ask the wild alligators why they haunt Florida. The better question is this: why would anyone want to think this way? Why is this worldview acceptable? More to the point: when did it become normal? Goldman Sachs is a creature of immense wealth and power. They (unfortunately) matter. Their preferences matter. Obama listened to them. Trump obeys them. They would have been ornaments in Hillary’s cabinet. What matters? What matters in our society? When we discuss what matters, we’re really discussing the appropriate order of our moral priority. The structure of our society, top to bottom, comes from how we rank our commitments. Take the annual federal budget, which is the single most unreadable human document until Kanye’s book is published. Budget questions aren’t just simple debates: in a very real sense, they determine who will live and die. How much money do we spend on bombs? How much money do we spend on homeless shelters? You get the drill. And that’s just money. The most important decision our society makes concerns public conversation: what we talk about, and what we don’t discuss. Generally, these decisions are constrained by politics, by opinions on what is and is not reasonable. You will be shocked to learn that the ruling class finds many things unreasonable. Goldman Sachs finds the dream of cured human race objectionable. Not because it’s impossible, and not because it is impractical, but because it would cut into the profit margin. That is what makes it unreasonable. But then, something happened. It’s hard to say what it was exactly; it might have been the fact that Goldman’s cochairman in the early Nineties, Robert Rubin, followed Bill Clinton to the White House, where he directed the National Economic Council and eventually became Treasury secretary. While the American media fell in love with the story line of a pair of baby-boomer, Sixties-child, Fleetwood Mac yuppies nesting in the White House, it also nursed an undisguised crush on Rubin, who was hyped as without a doubt the smartest person ever to walk the face of the Earth … [What Rubin thought] mostly, was that the American economy, and in particular the financial markets, were over-regulated and needed to be set free. Neoliberalism was the religion of the Clinton administration. It was a shared delusion with a shared set of beliefs. Their creed went like this: to get progressive policy, you had to accept conservative premises. Say you wanted universal health care. Under centrist logic, you couldn’t just say that health care was a human right. You had to justify it by saying it would help American productivity, or that the current system was too expensive, or that we had to remain competitive, or some other economic canard. You had to justify policy by appealing to pseudo-rational technocratic gabble. In the Nineties, you heard the strangest arguments. Like when Team Clinton argued that Social Security should be privatized … to save it. Neoliberal centrism outlived Clinton, and became the reigning orthodoxy of the political class. The pundits and politicians stopped making moral arguments. Instead, they relied on vague, managerial horseshit. According to centrism, the problem with the Iraq War wasn’t imperial hubris. We just hadn’t planned the occupation very well. According to centrism, the justification for healthcare wasn’t the obscenity of sick people dying in a rich country; it was that healthcare was inefficient, and expensive. According to centrism, the problem with poverty isn’t that it brutalizes human beings, but that it doesn’t allow for enough opportunity. No. Accepting the villains’ terms means accepting their value system. To discuss the problem of human suffering in the language of profitability is vile. It’s a form of cowardice, of flattering the mighty. What sets centrist thinkers apart is their unwillingness to confront power. If you hate racism—if you honest-to-God think it is evil—then it is not enough to condemn bigoted rural whites. You have to confront the corporations who exploit women of color, the magazine writers who entertain the Bell Curve, and the police who gun down a disproportionate share of Black people. You have to confront Yale, which renamed John C. Calhoun College only last year. Each of these institutions—Corporate America, the Media, the Police, and the Academy—have more power than backwoods white supremacists, but centrists find it easier to attack easy targets. Profit is not the basis for a good society. Everyone knows this. The Religious Right knows this: that’s why they speak of America becoming a Christian nation. Conservatives know it, when they argue that America is a place of freedom and justice. Liberals know it, when they describe this country as a home of diversity and opportunity. Fascists know it, whenever they sweatily tweet about their glorious future ethno-state. And Leftists like me know it, when we argue for the dismantling of economic power and social oppression. Note that none of these ideologies actually want profit as the foundation-stone. Whatever their politics, no serious adult human being would build a society where profit dictated everything. But in reality, that is the system we have built, whether we admit it or not. How we react to that unpleasant fact forms the basis of our politics. Therefore, here is what modern progressivism should mean: de-commodification of the necessities of life. Health should not be commodified. Water and food should not be commodified. Clean air and education should not be commodified. If you want to change the world, you must make moral arguments. As Goldman Sachs has already discovered, there is no profit in the important things. There are things that money just can’t buy. The unspoken corollary is that those things also cannot be sold—and certainly not at a net gain. You cannot organize a healthy civilization on bloodless utilitarian calculation or woke capitalism. Caring for people will always be a money-losing endeavor. 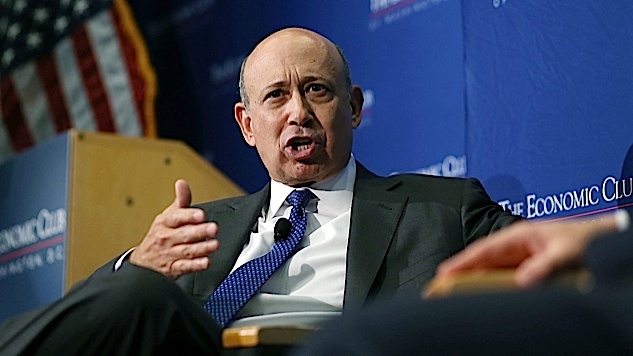 The Goldman Sachs way of thinking has cost us too much. To paraphrase a wise man, no-profit ought to have honor in its own country.